La canicule, the heatwave, has reached Brussels, with temperatures in the city these days exceeding those of Delhi. Unlike in India, life in Belgium is not designed for a hot climate. Air conditioners are a rare item in most households. The buildings trap heat. The large windows turn apartments into greenhouses. Last night I was dreaming that I was sleeping on the edge of an exploding volcano. It might as well have been our bedroom. Trying to retain sanity in this heat, I turned to classical Delhi remedies. Since escaping to the cool mountain resorts in Darjeeling wasn’t in the cards, I made a refreshing fennel seed sherbet, saunf ka sharbat. Sherbet is a cold drink of Persian origins, and Mughal era books are full of recipes for different kinds of sherbets–rose, saffron, fruit or tamarind. One makes a syrup concentrate with the selected ingredients and sugar and then dilutes a small amount in iced water. 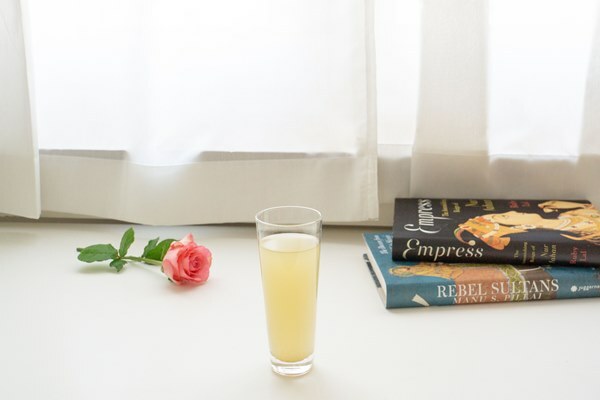 More complicated recipes call for several concentrates and infusions of jasmine or rose petals, but even the basic idea produces a delicious drink. Delicious though sherbet is, it’s also a medicine of sorts. Both fennel and cardamom, for instance, are known in India as cooling spices that calm pain, aid digestion and reduce bloating. I was on board with this idea, and the Ayurvedic wisdom was the main reason why I decided to try making a fennel sherbet during the heatwave. As soon as I simmered the spice infused water with sugar, I realized that I was already feeling more calm, refreshed and mentally balanced. 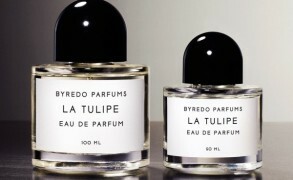 The aroma–the sweet-icy verdancy of fennel, the lemon sharpness of cardamom and its metallic rose accent–was so inviting that I was tempted to dab the syrup on my wrists. When I diluted the prepared concentrate in water with ice, I added rosewater and lemon slices to highlight the floral and citrus facets of the fragrance. It tasted refreshing and refined, worthy of a Mughal empress. 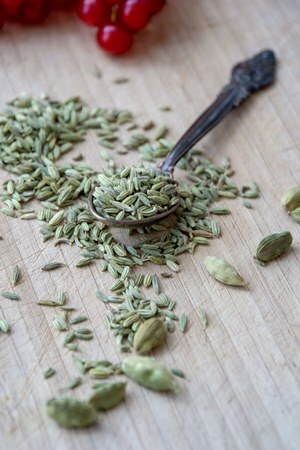 Cover fennel seeds and cardamom pods with water and soak for at least 2-3 hours (or in the fridge overnight). The soaking softens the spices and makes them fully release their flavor. Grind the soaked spices with their soaking liquid and an additional 1/2 cup of water in a food processor. Strain through a fine-mesh colander. Add the remaining 1/2 cup of water to the ground spices in the colander and strain again. Mix the spice infused liquid with sugar in a medium-sized pot. Bring it to simmer on medium-low heat and stir to help sugar dissolve. Simmer until the syrup thickens slightly, about 10 minutes. Take off the heat. Skim any foam that has risen to the surface. Cool. Add 2 Tablespoons of syrup to a glass with ice cubes, add 1/2 teaspoon rosewater and lemon juice to taste. Top with 1 cup of water. You can change the proportions to suit your own taste. Or you can dilute a large portion and store it in the fridge for an instant refreshment. Stored in a clean bottle in the fridge, the syrup concentrate can last for several months. Enjoy! Other cool summer drinks: Melon Horchata :: Rhubarb Rose Sherbet :: Purple Basil Sherbet. Victoria: Watermelon is always a good idea in this heat. I’ve been eating almost nothing else. I just am back from the library and put the Empress book on hold. For the summer I just do a simple rose syrup that I buy from the store and sparkling water and a few ice cubes. Victoria: You can also make a mint sherbet. You only have to use mint instead of spices. I’d grind it with some water, strain it and then cook it with sugar. This syrup can be your concentrate and then you can add water and lemon juice to taste. Or you can always make a simple mint tea, add orange blossom water and ice it. 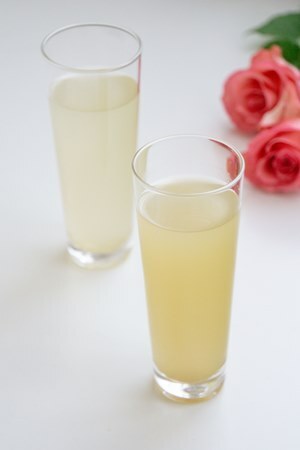 Victoria: My MIL says that fennel cools down the body, and the drink certainly feels refreshing. The good thing is that cooking the concentrate takes no effort on your part. Just let it thicken a little and it’s ready. Gunilla: This sounds lovely. I’m reading the Empress right now. Severine: You sound like me last fall. I was so tired of continuous weak immune system and bloated stomach that I ‘invented’ a tea to fix it. Jeanne: The sherbet sounds wonderful! Victoria: It also sounds very strange–hot weather and hail. Austenfan: On hot days like we had last week I sometimes contemplate a move further North. I’m not made for these temperatures. However, they do seem more difficult to deal with here than in the South of France where people adapt and city centres offer far more shade with all the narrow streets and narrow windows. Your recipe sounds delicious (as usual). I love fennel in food. I drink mostly cold perfumed green teas these days, and cold infusions. I got a number of the Jardins from the Palais des Thés and they are really good as a cold drink. I also enjoy making cold tisane (to be pronounced with a Poirot accent) with mint, tilleul and verveine. Very refreshing, and so easy to make. Just fill a jug with cold (filtered) water and add dried herbs or tea. Leave overnight in the fridge and you are done. Victoria: Yes, it’s been infernal inside the salon/kitchen. The bedroom and my office stay cool enough, unless, of course, it’s 37C outside. I was very curious about the cold-infusion tisane you mentioned and made it this weekend with linden and rose blossoms. It worked perfectly and I could taste more of the floral flavors than with the usual cold method. Thank you. It’s my new favorite way to enjoy herbal teas. Toni Kennington: The fennel seed sherbet sounds wonderful! maja: I usually add a pinch of salt to my daily watermelon and lime dose which is a staple during summer. The salt brings everything together. Ingeborg: I will absolutely try this! Yesterday it really got too hot for me, with officially 34.6 degrees here in Oslo. 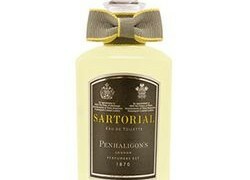 The recor is 35, daring back to 1901! Aurora: The hot weather (more like 35 degrees though a little bit less than on the continent) has broken with thunderstorms. All the beautiful English lawns are yellow and sparse.